Your hands are sometimes the first area to show visible signs of aging. Treat yourself to this creamy oil-infused sheet mask, which helps hydrate aging skin and leave it with a youthful-looking glow. Easy to use, all you have to do is wear it and peel it off to see beauty benefits — no rinsing required! Indulge at home or on the go for the ultimate luxurious experience. Very moisturizing for hands and cuticles and it lasts. You can also use more than once since there is lots of serum. That is all I can say, it is absolutely magnificant. A must buy. this product very soggy. did not like at all.too late to send back.Anna in Chicago. I SO wanted this to work. Unfortunately, this did nothing remarkable. I even left the "gloves" on overnight, hoping to get noticeable results. Using Vaseline Intensive Care hand lotion gave comparable result at a significantly lower price. Experience a spa-like luxury with this hydrogel mask. 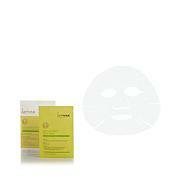 Smooth on the intensely moisturizing mask for an immediate cooling, soothing sensation. Leave it on for 20 minutes to help your skin look smooth, firm and radiant. It's the indulgence your skin has been begging for. What You Get (4) 1 fl.